Recently I came across a blog entry over at Dimemag.com. The entry talks about the new Converse collection. Here is of what Justin from Bounce Magazine had to say. "I hit up Soho this morning for the ‘07-’08 Converse Basketball preview. The most historic footwear company in basketball has come a long way in the past few years. The new product looks great and there is real positive energy and enthusiasm driving the brand. Product previews are often in stale show rooms, and the people showing want to be there less than you do. But, on occasion, they are actually worth the time and the Converse crew did a great job pulling this one together. The space was dope, the OJ was fresh, and the kicks were on point. We finished off the morning with a mini history lesson viewing the last molds used to make Larry Bird and Dr.J’s shoes, the first Converse basketball shoe ever made (around 1915), as well as an actual shoe worn by the Harlem Rens (’30s). New products to keep an eye out for are the Wade 3 (On sale 11/3), the “What If” packs (March), and the Dumalis. Check out more pics…"
I am loving this, it sounds like everyone is getting excited about what Converse is bringing to the table in 2008. Before I got into some of my thoughts I want to post some pictures that they had on there website so you can have a reference to what I am talking about. The first picture below is the first Converse basketball shoe ever made, circa 1915. 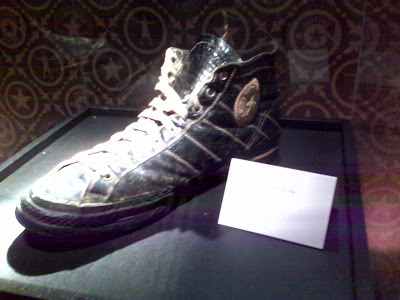 This is the shoe made for the Harlem Rens in the 1930's, you can click above in Justin's comments to learn more. Now here is the big daddy. I wish I could make the picture bigger, but I can't find a way. So the best thing I know to do is talk you through each smaller picture. Starting in the upper left box you see a few of the new models coming out, you can't tell much about them really. I also don't have a name for them, but Udonis Haslem and Maurice Evans have worn one of them during the preseason. Then moving to the right we see a pack with the Converse Revolution, which was supposed to be a new Chuck Taylor like shoe for last year. I've heard it was scrapped, but it looks like it might have some life again. Then another unknown basketball shoe followed by what looks like the Wade 3.0 in a Black/Red colorway. The third picture on the top row is special makeup of the Pro Leather. The second row starts with the Dumalis that Justin talked about liking. I've got some more pictures of these to share later. Next pictures of Dr.J and Larry and Magic's Weapons. The third row beings with another shot of the three shoes featuring the Revolution, unknown, and the Wade 3.0, this may be the "What if" packs that Justin talked about. 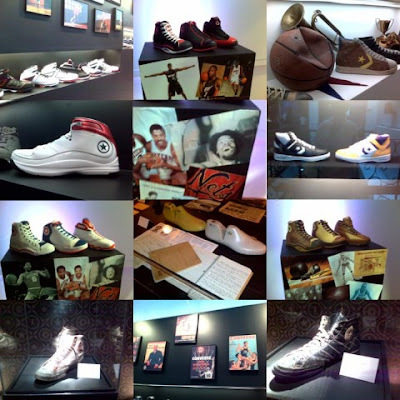 Then the foot molds that Justin talked about for Dr.J and Larry Bird, followed by another pack of the three shoes mentioned before. The only new picture in the last row is that of some Converse Yearbooks from back in the day. Someday I'll try and provide a little history lesson on those. Big thanks to Dime Magazine and Bounce Magazine for posting their story, please go by and check out their sites. 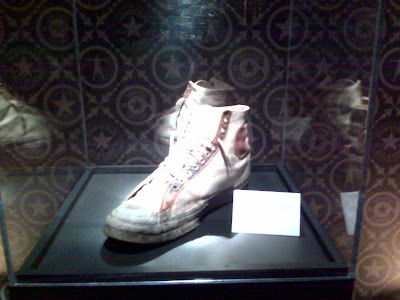 I'll try to get some more information of the unknown sneakers and get that information to all of you. Thanks again for stopping by. This is a great post and I appreciate you including the link to our site from Justin's write up! Here is more scoop material about the Black Fives footwear. I'll be sure to keep you commented up with updates and links.